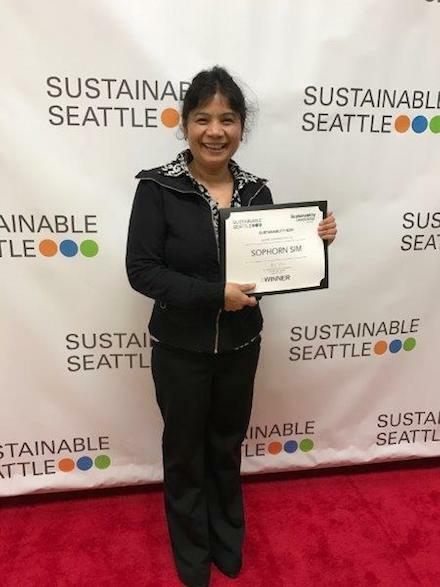 White Center's Sophorn Sim was presented with a Sustainability Hero award from Sustainable Seattle for her work in her community and at ECOSS helping build resilient immigrant communities by connecting them to their environment through education and experiences. Sustainable Seattle announced the winners of their Sustainability Leadership Awards – known as the "Sustainability Oscars" – at their annual dinner Friday night at the Swedish Cultural Center. The evening's top prize, the Sustainability Hero Award, went to Sophorn Sim, an environmental educator working with immigrant residents and fishermen in the Duwamish Valley. Business, organization, and individual award winners in six categories were recognized at the event for their efforts to make the greater Seattle region a more sustainable, resilient and equitable place to live. "It was such an inspiration to hear everyone's stories and see the amazing advances our region is making for our future," said Sustainable Seattle's Executive Director BJ Cummings. "It was also important to celebrate the people and organizations doing this work, especially now, when we need amplify the voices of our sustainability leaders." KNKX environmental reporter Bellamy Pailthorp emceed the event, which was opened by Duwamish Tribal leader Ken Workman, a direct descendant of Chief Si'ahl, and Julie Whitehorn of Sami Searvi, representing the indigenous people of northern Europe. The awards are competitive. Nominations were solicited from the community and narrowed down to top five finalists in each category. Winners were selected by a panel of 15 independent judges who have significant experience and involvement in sustainable business, agency and local community initiatives. Sophorn Sim, a former refugee who fled Cambodia in the mid-1970s, for her work in her community and at ECOSS helping build resilient immigrant communities by connecting them to their environment through education and experiences, such as healthy fishing, clean water and access to parks and recreation. Fremont Brewing Company for incorporating environmental sustainability and social responsibility practices into their business, including diverting waste streams into clean energy, providing low-cost health insurance and a minimum $15/hour wage to all employees before it was required by law, and more. Ikea Seattle for the sustainable design of their stores, active community involvement, product design innovations and partnering to plant 5,000 trees in the Mt. Adams Post-Fire Restoration Area. IKEA is working towards a goal of 100% renewable energy; their new Renton store has the largest rooftop solar installation in Washington. King County-Cities Climate Collaboration (K4C) for spearheading development, technical assistance and outreach that helped lead to the adoption in July 2014 of countywide greenhouse gas reduction targets of 25% reductions by 2020, 50% by 2030, and 80% by 2050. K4C is a consortium of King County and 11 cities. APANA for its innovative technology that helps commercial and industrial water users save money and manage their water using real-time, automated information. Users, such as supermarkets, carwashes, food and beverage processing facilities, and commercial buildings, have demonstrated an average 22% savings in water use. No Gasoline Day – Coltura for helping change cultural norms about the use of gasoline through mobile and interactive live performance, social media, and powerful imagery and videos challenging the cultural status quo. In 2016, they produced mobile theatrical series performed at art festivals and gasoline stations across Seattle. The Sustainability Leadership Awards, began in 2001 by local non-profit Sustainable Seattle, recognize the accomplishments of those raising the bar for sustainability in the greater Seattle area. The nominations and awards celebrate and encourage positive change as well as appropriately recognize the time and energy invested in transforming the local economy, community and environment, making Seattle a national sustainability model.